With Mother's Day is right around the corner it's the perfect time to whip up one of these stylish twine wrapped photo frames! The twine wrapping technique is simple and the results are beautiful. This is a great project to do with a bunch of friends, because it doesn't require too much concentration and the frame can be completed in a single evening. So invite your friends over and let's get crafting! P.S. Be sure to check out the printable version of the instructions linked in the supply list below. Step 1: Remove the back and glass from the photo frame. You may need to use a screwdriver or a key to bend the metal clips open. Be careful not to break the glass or cut yourself, the glass edges and the metal tabs can be sharp! Step 2: Remove the label from one of your twine Bon Bons. Line up the end of the twine with the beveled edge of one of the long sides of the back of the frame. Tape the end in place. The bottom edge of the tape should lay flush with the beveled edge of the top of the frame. Step 3: Tightly wrap the twine around the edge of the frame, making sure that it lays flat on the front and the back of the frame. Stop wrapping approximately 1 cm from the outer edge of the frame. Place a piece of tape over the ends of the twine, the edge of the tape should lay flush with the beveled edge of the bottom of the frame. Cut the end of the twine just outside the tape. Step 4: Repeat step 3 on the opposite side of the frame. When you are done, both long sides of the frame should be wrapped in twine. Step 5: Using your second color of twine, line up the end with the middle of the beveled edge of one of the short sides of the back of the frame. Secure the twine with a piece of tape. Step 6: Tightly wrap the twine around the edge of the frame, as you did in steps 3 & 4. Stop wrapping approximately 1 cm from the outer edge of the frame. Tape the twine down in the middle of the back of the frame and cut the twine just outside of the tape. Step 7: Repeat step 6 on the other short edge of the frame. All four sides should be wrapped when you are done. Step 8: Tie your first color of twine around one of the short sides of the frame, in the inner corner. The know should be on the back side of the frame. Step 9: Wrap the twine around the frame, overlapping the previous wrapping you did on the short side. Make sure the twine lays flat on the front and the back, but do not wrap as tightly as you did on previous sides. The twine should have a little give to allow for reinserting the glass. When you reach the other corner, secure the twine with a double knot on the back of the frame. Step 10: Repeat step 9 on the other short side of the frame. Trim the loose ends of the twine or weave them under the wrapping. 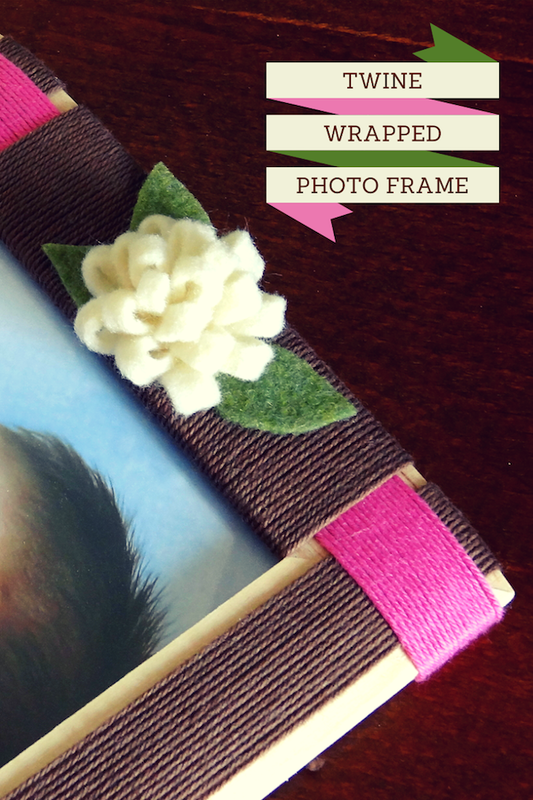 Step 11: (Optional) Use your hot glue gun to add felt flower embellishments to your frame. 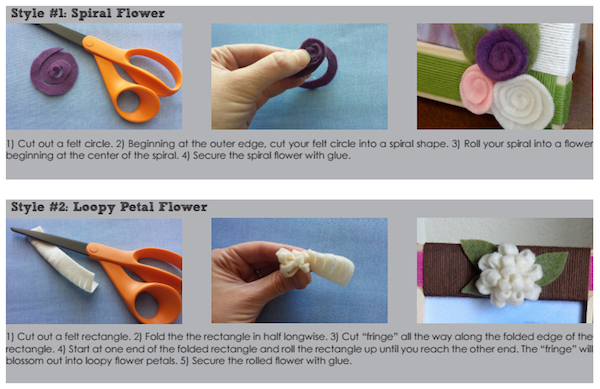 See flower instructions below.